Sports and Remedial Massage is not just for athletes; anyone leading an active, healthy life could benefit from this type of massage to keep their body in check. In fact, the regular use of a sports massage therapy can prevent a variety of injuries. Contact Move With Eze to discuss with a practitioner. Sports & Remedial Massage is an essential part of any rehabilitation or sports training programme. The maintenance of efficient muscle performance and flexibility allows the body to recover and develop at an accelerated rate. The regular use of a sports massage therapy can prevent many forms of musculoskeletal injuries & issues by detecting muscle fatigue, postural imbalances, inflexibility and minor strains and sprains. Sports and remedial massage encompasses a variety of techniques to restore muscle tension and musculoskeletal function. We take a brief medical history and identify the reason for the treatment. We recommend clients to arrive a few minutes early as this forms part of the first treatment. We may carry out a postural or bio-mechanical assessment to access global muscles and their effects on the presented symptoms and conditions. Following an assessment, we provide the client with a treatment plan and timescales to achieve the desired goals. Effleurage, petrissage, tapotement, vibration and shaking/rocking are all techniques used to help with circulation, drain muscle waste and bring back functionality whilst helping you feel better. Myofascial Release is a non-invasive, gentle hands-on soft tissue technique that works on the fascia to release restrictions. This technique takes the pressure off pain sensitive structures such as nerves and blood vessels, and restores alignment and mobility to muscles and joints. 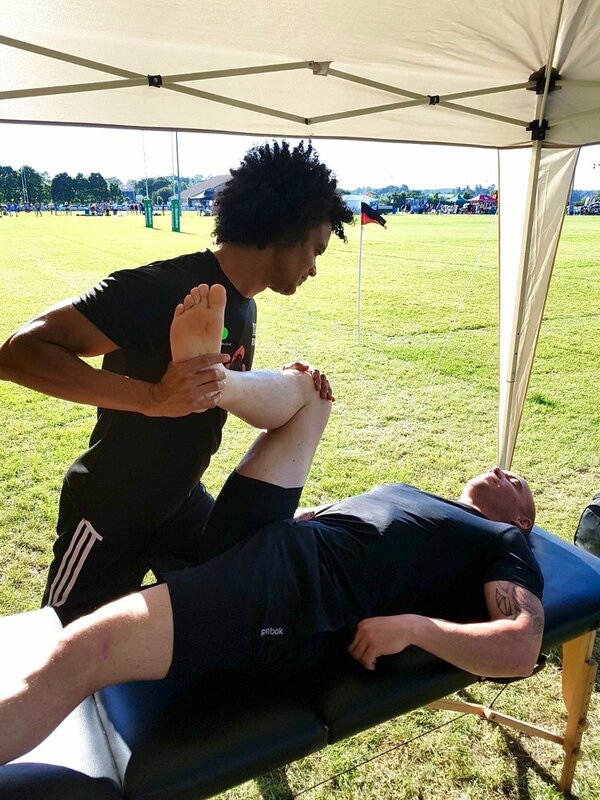 STR is a dynamic and a highly effective technique used to normalise and bring back functionality on muscles and connecting tissues. STR aids by elongating the tissue, softening the area of tension and breaking up scar tissue. MET uses gentle manual contractions to relax, lengthen soft tissues and normalise joint function. This technique is used to treat postural imbalances and injury rehabilitation. This is used to alleviate hypersensitive areas in soft tissues through cycles of compression and release. This technique can help manage pain and stress from chronic injuries. Positional release helps to relieve pain and discomfort by placing an area of the body into a position of “ease”. This helps resolve musculoskeletal dysfunction. Following treatment, Move with Eze will offer home care and/or remedial advice which forms part of the client’s treatment plan. This may include stretches, functional exercises and health tips to do at home, which can help restore strength, flexibility and awareness within tissues and joints. Move with Eze offers complimentary rehabilitation after each massage. “Uju manages to combine professional understanding with firmness and can therefore deal sensibly with whatever athletic ambitions – or physical shortcomings - you may have. “I was feeling very middle-aged when I started training with Uju about 6 years ago and during that time she has encouraged me from complete inactivity to running half marathons, regular exercise and cycling with the benefit of losing 20 lbs in the process. She tailors an exercise plan to the individual, focussing on mobility, posture, balance and the natural movement of joints and muscles. She also considers diet and mental attitude as part of an holistic approach to improving health and fitness. “Uju is a remarkable massage therapist. Her treatments are tailor made , and intimately address deep seated tensions and patterns in the body . She offers a unique kind of treatment using muscle activation, positional release, and specific deep connective tissue work, Uju expertly custom tailors the treatment to target where your body is holding tension. It’s as if she has X-ray vision, You can feel your joints pop as your muscles and the deep connective tissues release. As well as a wonderful treatment Uju also considers how you move in every day life, and gives tips and exercises to rebalance any problem patterns you have become accustomed to .